So...about me not blogging for about 4 months. I knew I would be bad at this. I will say it again...I am going to try and be better about this. Right. So basically, the day after school started in August my life was completely consumed with elementary education. What a fun, crazy, stressful, challenging, confirming, amazing semester it was. I had the amazing privilege to observe all semester in a 4th grade classroom at George Hall Elementary. I love this school. My class was so fun and I learned so much. I have pictures but unfortunately....I cannot show them right now because my computer doesn't have the software on it. (But that is another story that goes along with this semester and contributed to the stressful part of it!) Anyways, I am thankful that I will be back in this same classroom next semester!! All of my classes consumed the remainder of my time. I stayed on my computer constantly...and as a result...my computer pretty much died. Luckily, I am on the inside with a mac professional and he helped me revive it! I have to say, this semester was probably my craziest but also one of the best. I barely had a social life but I am grateful because the Lord definitely continues to confirm that I am supposed to be a teacher and I cannot wait! 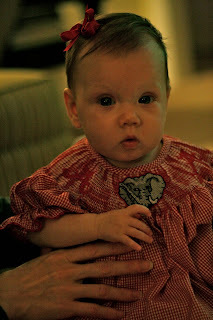 Not even and Auburn fan could deny that she is so cute in her Alabama dress! Roll Tide! Anyways, so my excuses for not blogging for four months basically consist of school. I have been on Christmas break for a couple of weeks now and honestly have not known what to do with myself. It has been nice to rest. Christmas Eve is tomorrow which is exciting and Saturday I am going to Phenix City to visit Brett and his family! That is one hard thing about breaks....all my college friends and boyfriend go home. Boo. But, this has been a great time to be with family! I have been so encouraged and refreshed! So..hopefully, it won't be four months before I update again! I really do enjoy this blog even though I am probably the only one who reads it....I really should make time to do it. haha. Oh well...Merry Christmas Everyone! !